Derek Hammock (BBA ’15, MACC ’16) promotes building and maintaining relationships. Derek Hammock (BBA ’15, MACC ’16) is a certified public accountant for EY. Derek credits much of his success to the relationships he formed at UGA. He gives to UGA to support its reputation as one of the top public universities in America. He also serves on UGA’s Metro Atlanta Young Alumni Leadership Council. Derek Hammock (BBA ’15, MACC ‘16) majored in accounting at the University of Georgia’s Terry College of Business because of the opportunities it would afford him later in his career. Currently, as a certified public accountant for EY (Ernst & Young), he enjoys the challenge of working in a constantly changing environment. The friendships Derek formed at UGA helped him reach his current professional success. He gives to UGA to help provide students with opportunities to build relationships essential to their careers. Derek’s favorite UGA memories involve the friends he made through the Leonard Leadership Scholars Program. Part of the Institute for Leadership Advancement, this two-year leadership development program focuses on creating values-based, impact-driven leaders who are committed to civic issues, service and volunteerism. One of the most important relationships Derek made was with the program’s founder, Earl T. Leonard Jr., former senior vice president for corporate affairs of The Coca-Cola Company. Leonard continues to act as a friend and mentor for Derek today. 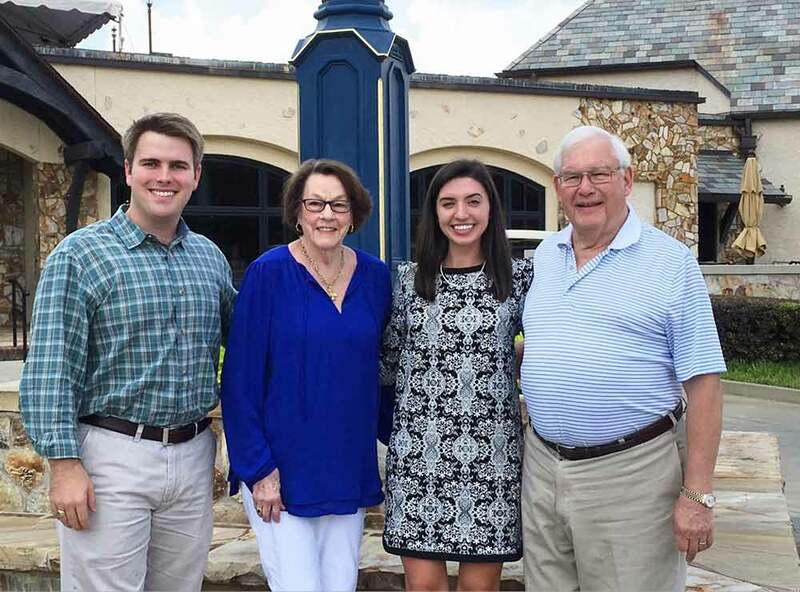 Derek and his fianceé, Sierra Dixon (AB ’16), having lunch with his longtime mentor Mr. Earl Leonard, founder of the UGA Leonard Leadership Scholars Program, and his wife, Bebe, at Capital City Club in Atlanta, Georgia. 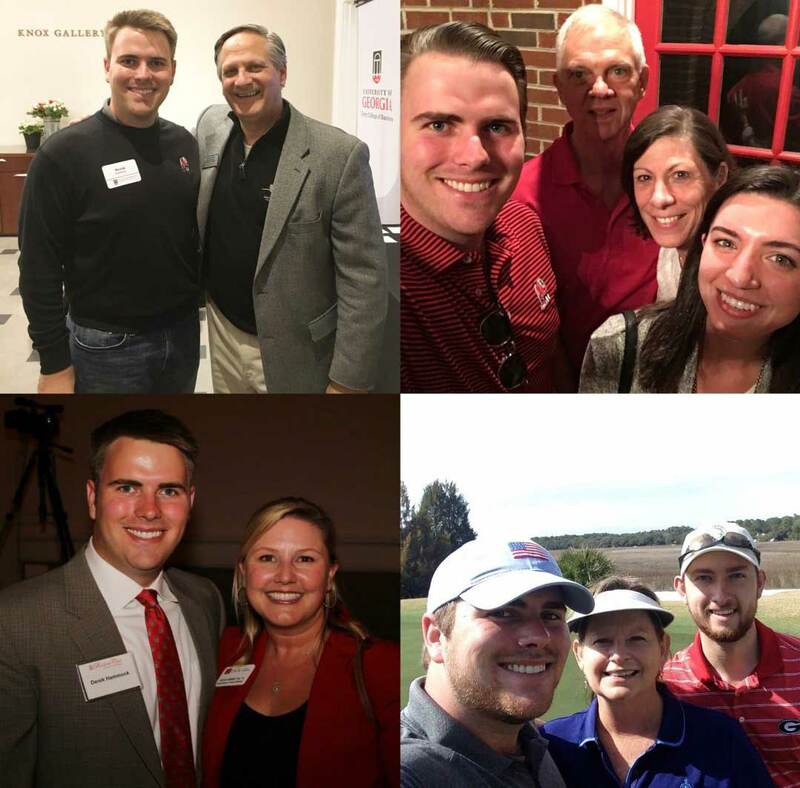 Derek met many mentors at UGA who have influenced his personal and professional growth. They continue to be close friends today. Clockwise starting from top left: Tim Keadle, former president of the UGA Alumni Association; Carl and Barbara Parks, met through Derek’s service-learning project with the Athens Community Council on Aging; Julie Cheney, former senior director of operations of the UGA Alumni Association; Ruth Bartlett, immediate past president of the UGA Alumni Association and Chad Woodhead (BBA ’15), UGA roommate and future groomsmen. Derek supports the Institute for Leadership Advancement Support Fund to promote networking and leadership development opportunities for Terry students. He also gives to the Georgia Fund, which supports UGA’s most pressing needs, and the J.M. Tull School of Accounting Fund, which provides enrichment opportunities for the program’s students and faculty. In addition to helping students develop into leaders while forming long-lasting relationships, Derek hopes his gifts will continue to enhance UGA’s reputation. Most recently, UGA climbed two spots to No. 16 in the U.S. News & World Report 2018 ranking of best public national universities, the highest ranking in the university’s history. Many national rankings include the percentage of alumni who donate to their alma mater as a factor in their standings. Private giving also helps UGA attract talented students through scholarship support and enhance the learning environment for greater student success. “I give back to help current students have even better experiences than the incredible ones I had,” said Derek. Derek serves on UGA’s Metro Atlanta Young Alumni Leadership Council. As a member, he works to ensure alumni see the value of giving back.